Ghosts make for handy onstage metaphors, usually as stand-ins for something lurking in another character’s subconscious. They are commonplace companions for Adelina, the titular figure in Ginger Lazarus’s domestic drama “The Housekeeper,” now receiving its world premiere in a production by Fresh Ink Theatre. Adelina’s specialty is working for widowers whose deceased wives have a habit of dropping by to chat while she’s folding laundry. The tart, admirably self-possessed (no pun intended) ghost in question is Carson (a likable Gillian Mackay-Smith), who left provisions in her will for a housekeeper to serve her husband, Charlie (Dale J. Young), and 14-year-old daughter, Kaila (Alexis Scheer), after her death from a lingering illness. She visits Adelina (Margarita Martinez) ostensibly to see that a crucial posthumous errand is accomplished, but soon we start to question just who is haunting whom. The ground covered here is pretty straightforward, though the predominance of female voices is well appreciated. 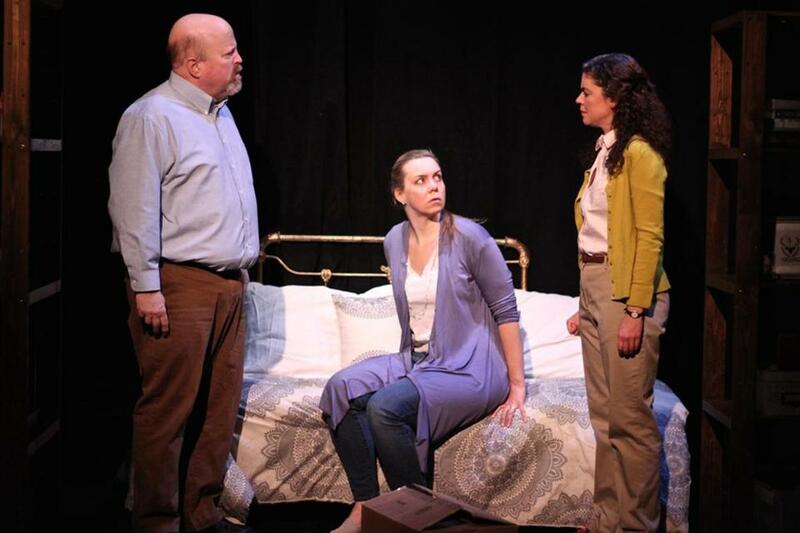 The play’s three women drive the story, while its sole male reacts. Carson, who in life was a professor of feminist and gender studies, is wounded by her inability to pass on her accumulated wisdom to her daughter. Her best effort in that direction was to leave her a heavy box of books with titles like “Gender in the Victorian Age” and “The Male Gaze,” destined, it seems, to remain unread. Now, a word about class. The script stipulates that Adelina hails from an immigrant family, and we learn that this college graduate stuck with domestic work because of the economic pressures of single motherhood. Her son was admitted to MIT but attends community college because a medical crisis emptied the family bank account. Yet when she’s asked to take on the added professional duty of being a mother figure to the daughter of her middle-class, white employer, we’re ultimately asked to glance past the unequal standing from which she considers the situation. At a key juncture she’s handed an apron, and the audience is meant to take this, with lump in collective throat, as a poignant symbol of her acceptance by the family. (Pardon my face palm.) It’s disappointing that a play so aware of gender issues would fumble with the issues of class that hover near its core. Shana Gozansky’s direction is fluid and clear-eyed, finding many quiet but affecting moments to savor while making good use of Arianna Knox’s handsomely naturalistic, split-level set. Darren Evans’s subtle but effective sound design is an asset as well. “In stories, everything has a purpose,” Carson muses, and there’s indeed a schematic feel here. Conflicts are introduced, amplified, and then resolved. Foreshadowing announces itself and is faithfully paid off later. Character arcs are methodically traversed, one symbolic marker at a time. This sometimes drains the drama of urgency, as we await the next churning of gears. “The Housekeeper” efficiently hits all its marks. But it could stand to be a bit messier. Directed by Shana Gozansky. Presented by Fresh Ink Theatre.